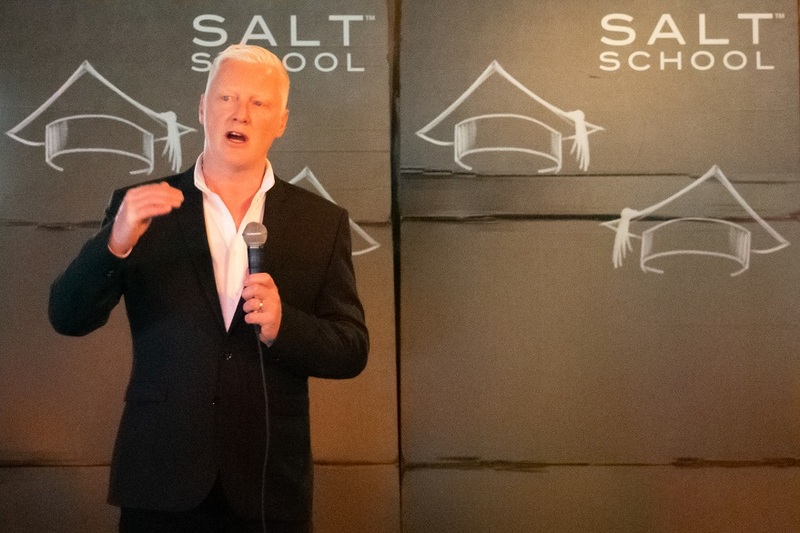 Salt School, the hospitality training program created locally by David Bowd of Salt Hotels, graduated its fourth class of students Saturday and now has plans to roll the program out across the nation. The success of the Salt School has led Bowd to extend the program to his other properties: Salt House Inn, Eben House and The Chequit. And now, as a principal of west elm Hotels, Bowd [shown below] will roll out a similar training program – entitled the west elm Academy – in time for the slated 2020 hotel openings in more than seven cities, which includes Detroit, Minneapolis, and Oakland. The free training program was held ahead of the upcoming Asbury Ocean Club Surfside Resort & Residences, a boutique hotel, luxury condominiums, and commercial project by the city’s master waterfront redeveloper iStar, set to open its doors this summer. Funded by iStar, the program was conceived with the goal of giving anyone in the community – of any background, experience level, age, race, and orientation, the opportunity to receive training by the best in the business. The curriculum included tutorials centered on the business of hospitality, the guest experience, food and beverage management, talent and human resources, revenue management, hospitality and the law, sales and marketing and social media. This year, the list of industry professionals included Salt Hotel executives; Tim Kirkpatrick, known for his work at The New York Palace Hotel, Morgans Hotel Group and Boston Park Plaza Hotel; Hospitality Executive Recruiter Suzanne McIntosh; and James Bryant, known for his work at the Morgans Hotel Group and Starwood Hotels and Resorts. Locally, Cheripka; Tina Kerekes of David Clinch’s Transparent Gallery; and representatives from Asbury Park Brewery and Asbury Park Distillery, also led tutorials during the 8-week training, held Saturdays at the Boys and Girls Club on Monroe Avenue. With the state losing 2,600 jobs in December 2018, Salt School serves as a strong force for fueling jobs within the community, program organizers said in a written statement. The program is a testament to iStar’s investment in the community, dating back a decade with initiatives that include the Summer Experience Crew training program and community service contributions alongside vendor partners that total close to a quarter of a million dollars to local nonprofits like the Boys & Girls Club of Monmouth County in Asbury Park. Salt School launched in tandem with The Asbury’s May 2016 opening, ultimately employing over 100 graduates, Bowd said. Over the years, close to 300 locals have obtained diplomas. This round offered hospitality training to 220 applicants; 140 accepted; and 89 [41 from Asbury Park] – ages 16 to 65, graduated Saturday. The goal will be to hire over 80 percent of the graduates for Asbury Ocean Club Surfside Resort and additional staff for The Asbury and Asbury Lanes, Bowd said. To further support the community, Salt School will put on a job fair for remaining graduates and alumni, equipping local businesses with trained staff. Hiring for the Asbury Ocean Club is ongoing. Those interested in jobs at Asbury Ocean Club can email [email protected].